Is the hot weather killing your sense of fashion and eating up your savings to stay cool? If this is you, then you’re not alone...don’t worry, with this Look for Less you’ll learn how to keep your cool while looking cool. Don’t let the summertime blues get you down this season -- here’s how to keep your pockets looking green and get a high-fashion look with less than $100. The Designer Look: Bill Blass gives us a nautical chic all-blue look that screams comfort and class. 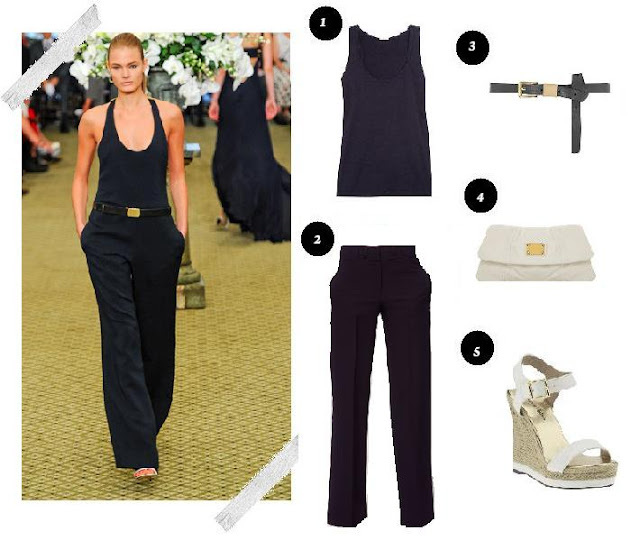 Here, we have a navy blue scoop neck racer back tank and trendy wide leg trousers held together at the waist by a simple gold buckle belt. The best thing about this look is how easy it is to dress it down or dress it up for a luncheon or office meeting. To take this look to business casual, don a blazer in a neutral color (like black, cream or white). Avoid going for colors, as blue isn’t as versatile fashion-wise as you might think. Forego that neon blazer you have and save your pop of color for a small clutch or handbag. For further office attire, wear a closed-toe heel or peep-toe wedge, classy yet conservative. Fashion Tip: When you have a top with such a low neckline like this one, skip the necklaces. Low tops already draw enough attention, and even the classiest of pieces like your mother’s pearls can make this look go wrong. Save your jewelry for a simple cuff bracelet or even watch. With a look like this, minimalism is always best. Remember, when it comes to summer fashion, the key to looking stylish is keeping cool -- sweating it out in a warm outfit is never good! If you have a look you want us to Look for Less, shoot our editors an email, and we’ll do the rest! wow, I love this look. Its so sophisticated yet casual. Thank you for posting the information too.